At The Academy we know that musical experiences in childhood can actually accelerate brain development, particularly in the areas of language acquisition and reading skills. That’s why we find so many ways to incorporate music in our preschool curriculum. You’ll find music is an important part of our program at all our preschool locations, serving Nashville, Franklin, Brentwood, Hendersonville, Murfreesboro, and Spring Hill. Songs strengthen memory skills, such as learning the ABC’s by singing the alphabet song. Music and lyrics help children learn the sounds and meanings of words. Rhyming lyrics help children notice and work with the sounds within words. This in turn helps them make predictions about pronunciation when they read. Dancing to music helps children build motor skills and practice self-expression. Playing a musical instrument enhances fine motor skills. Making music with other children gives children a feeling of belonging to the group. Children who are shy or have trouble relating can freely participate when it comes to music activity. Listening to music can soothe and provide a sense of well-being. For example, playing music at nap time can help children relax and rest. You may not be able to carry a tune, but you can still enjoy music with your children. 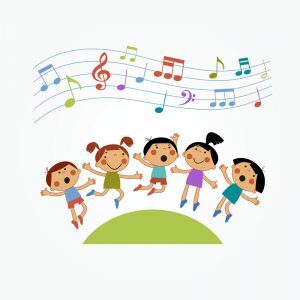 Have a weekly dance party, tap rhythms on oatmeal boxes, do sing-alongs while riding in the car, play a soothing CD at bedtime, make up silly songs or add new words to songs, such as “Mary had a little fish.” Make music a part of our family culture.